All parents will tell you that having a child is the single most important milestone in their lives. But with kids comes change, and worry, and the realization that things you’d never once considered are going to occupy your thoughts 24/7 for the next 18 years (or, more accurately, the rest of your life). Which brings us to flooring. We get asked a lot about kid-friendly flooring, for good reason! New floors are an investment that you want to last for a long time, and kids’ needs change over the course of their childhood. If you outfit the entire home with baby-friendly foam, you might regret that choice in 10 years, when your baby is in elementary school and at less risk of hurting themselves because of a fall on the floor. The big three in flooring are hardwood, carpet, and vinyl. But those aren’t necessarily the best for kids. Read on to find out what you should consider instead. There’s nothing inherently wrong with hardwood floors. But the fact is, they’re hard—and can be a hazard for kids learning to walk. Faux hardwood, on the other hand, is more forgiving than hardwood while still giving your that classic wood floor look. It’s more resistant to scrapes, scratches, and dents from toys or moving furniture. It’s also more cost-effective and its relative softness makes it easier on the feet and ankles. Why area rugs? For one, they add extra softness for those baby and toddler years. But they’re also more easily replaceable than carpet—and you’ll need that. Between spills, spit-up, and accidents, carpet is destined to get stained quickly in a home with young children. Carpets and babies seem like a match made in heaven — but that’s only true if you don’t mind all the stains. Nobody wants to spend a ton of money on brand-new carpeting, only to ruin it within a year or two. As we said, area rugs are a good compromise. But if your heart is set on carpet, consider carpet squares. They’re inexpensive and easy to install. Best of all, if you find yourself facing a spill you can’t get out, you can replace them by the square instead of redoing the entire room. Though vinyl has made great strides, some health groups recommend parents with young children not buy vinyl flooring. Why? It has to do with volatile organic compounds (VOCs), which have been linked to headaches, dizziness, and respiratory illnesses. The flooring industry has a FloorScore certification process that each floor goes through, where it’s rated on its level of VOCs, and most contemporary vinyl flooring options pass this test. Still, many parents feel it’s better to be safe than sorry. 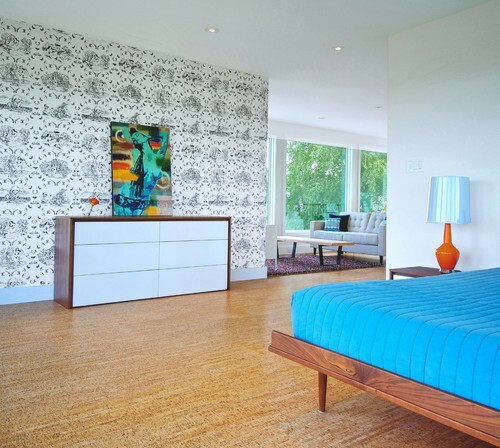 To get the relative softness of a vinyl floor, consider cork flooring. It’s insulating, quiet, and difficult to scratch. It’s made from a renewable resource, which means it’s one of the most environmentally friendly flooring options available. It won’t hurt kids if they fall down. Plus, it’s resistant to mold and mildew. The downside? It has a low resistance to moisture, so it needs to be resealed every ever years. Want to learn more about kid-friendly flooring? Stop by our showroom to speak to an expert and test our floors today!